Having been seemingly unable to learn to play guitar myself I used to have to imagine what it must be like being up on stage metal thrashing mad with a circle pit going nuts just in front of me. Then along came Guitar Hero to save all my fellow plectrum-challanged rockers. 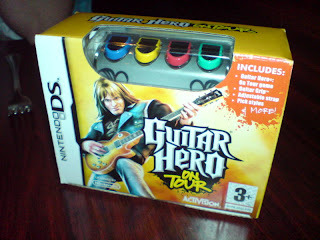 Now they've brought out a portable version for the DS, called Guitar Hero On Tour. I persuaded my girlfriend's brother to buy it for her birthday to replace the Brain Training that was taking up an unhealthy amount of her free time. Obviously I had to 'help' her open the box and get it set up. Within 2 minutes I was rocking out to Twisted Sister. Airline passangers of the world prepare to be annoyed by the frustrated metal head moshing in the window seat.